In Texas a serial killer is executed, taking to his grave the identity of his only child. In Boston a nine-year-old girl is abandoned in a hospital, then adopted by a wealthy young couple. Twenty years later, Melanie Stokes still considers herself lucky. Until. . .
"Sheer terror. . . A great read"
"In her newest, Gardner (The Perfect Husband) indulges her fascination with the dark side of family life, where the ties that bind also gag, choke and strangle. Once again, Gardner serves up suspense at a furious pace." 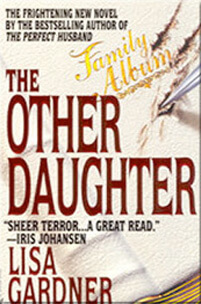 "I predict readers will find The Other Daughter very hard to forget."